Someone who dons a suit just about every day is exceedingly familiar with the qualities of different materials, from their comfort level and how they fit one’s physique to their breathability during different seasons. Regardless of the material, the skill of the tailor is what will dictate what suit is ideal for what weather and occasion. Unbeknownst to many, the heat retention of a suit occurs within its internal structure, such as shoulder pads and lining. While the layers and lining of a suit keep individuals warm in the harsh winter weather from Cleveland, Ohio, to Youngstown, Ohio, full lining may not be necessary when the humidity of the summer arrives. Jabbour’s Clothing & Tailoring in Stow, Ohio, offers affordable men’s tailor-made suits with any alterations necessary to make it fit as if it were made for them. This local tailor offers 37 years’ experience when anyone walks through the doors, whether they are a young soul from Akron, Ohio, looking for a new suit for multiple occasions, a seasoned suit wearer adding to their collection, or someone needing alteration services. This local suit shop not only offers price matching on suits, but they also offer men’s suit deals, wool and polyester-rayon suit sales that will accommodate a variety of budgets. Anyone from Akron to Cleveland who has visited Jabbour’s Clothing & Tailoring in Stow can attest to the unmatched level of service and quality of their affordable men’s suits. Individuals who walk through the doors are welcomed like a long-time friend and never feel the need to go anywhere else. This local suit shop not only offers exceptional service and price matching on suits, but also men’s suit deals on a consistent basis. They are currently extending a wool suit sale that consists of two wool suits for $600 with the appropriate alterations, and a polyester-rayon suit sale at two suits for $489. Contrary to popular belief, wool suits offer breathability and can keep the wearer cool in the summer, while being exquisite and extremely durable. Blends such as polyester and rayon are more affordable and high in quality yet may not last as long as their wool counterparts, so the choice lies in the intended frequency of wear and purpose of the suit. 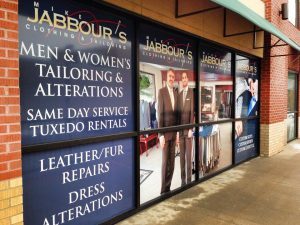 Jabbour’s Clothing & Tailoring not only offers tailor-made men’s suits with fantastic deals, but they also offer alteration services on a wide range of products, from wedding dresses to jackets. They can attend to any need a customer may bring to them. This local tailor accommodates time frames and differing requests from his clients, offering his 37 years’ experience to each client. Perhaps someone from Youngstown arrives with a jacket that needs its zipper repaired. He will go above and beyond in service, advising where something is necessary, as well as refusing to waste someone’s hard-earned money doing more than is required. He will never oversell if he believes the product doesn’t need the service. People who have left reviews for this local suit shop say that they couldn’t believe they can find service like they provide anywhere anymore and will definitely be returning to Jabbour’s. 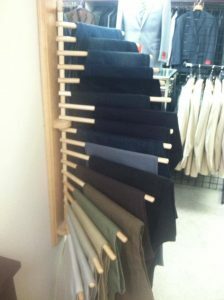 Some men from Cleveland, Ohio, to Akron, Ohio, who have never shopped for an affordable men’s suit consider the idea comparable to shopping for a vehicle; however, they will be completely comfortable after the warm welcome they receive when they walk through the doors of Jabbour’s Clothing & Tailoring in Stow, Ohio. This local suit shop accommodates their customers’ varying budgets with price matching on suits and men’s suit deals on a regular basis — including a wool suit sale at two for $600 and a polyester-rayon suit sale at two for $489. 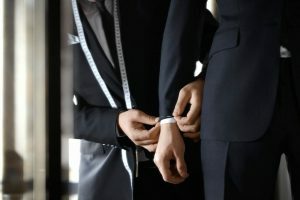 This local tailor’s outstanding service and experience lend to the best tailor-made suit, as well the most comprehensive alteration services, that will keep customers from Youngstown, Ohio, and beyond returning year after year. This entry was posted in Alterations, Clothing, Men's Suits, Shopping, Specialty Shops and tagged affordable men's suits Cleveland Youngstown Stow Akron Ohio, alteration services Cleveland Youngstown Stow Akron Ohio, Jabbour’s Clothing & Tailoring, local suit shop Cleveland Youngstown Stow Akron Ohio, local tailor Cleveland Youngstown Stow Akron Ohio, men's suit deals Cleveland Youngstown Stow Akron Ohio, polyester-rayon suit sales Cleveland Youngstown Stow Akron Ohio, price matching on suits Cleveland Youngstown Stow Akron Ohio, tailor-made suit Cleveland Youngstown Stow Akron Ohio, wool suit sales Cleveland Youngstown Stow Akron Ohio by admin. Bookmark the permalink.